What is a Calendar Form? 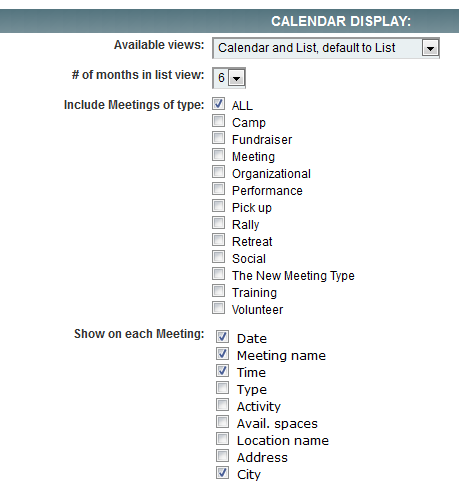 While meetings can be limited to viewing on a single Calendar Form, it is also possible to view the same meeting on multiple Calendar Forms. A good example of why you would do this is if you would like people to register for a meeting with different branding but don't want to create two meetings. A more typical reason for creating more than one calendar, is to separate your meetings by type. An example of why you may want to do that is to have separate calendars for trainings and social events. The most important thing to know is that changes to the calendar form will change those settings for every meeting that is viewed/registered for through that calendar. For example, if you require a work phone on the personal page of your calendar form, a work phone will be required for every meeting that is registered for through this form. Go to Setup>Form Builder in the menu. The click the Green Circle with a Plus Sign. 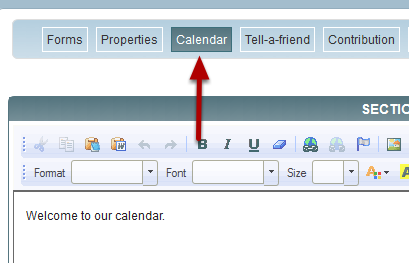 On the following page, change the Type to Calendar form template and enter a form id and title. Click Create New Form. Most of the process of configuring a new calendar is exactly the same as configuring any of your other Databank forms. If you haven't watched the video for creating a new donation form, please view it here and come back as the rest of this tutorial will build upon that knowledge. The page that is unique to Calendar Form is named Calendar in the sub navigation menu. 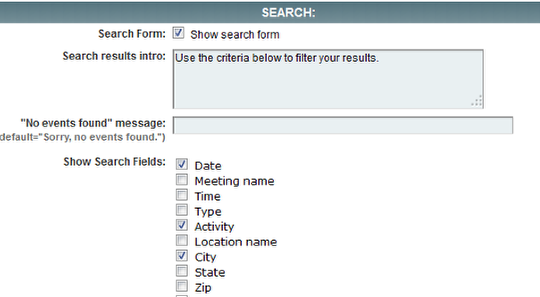 To enable search, you must check Show search form. 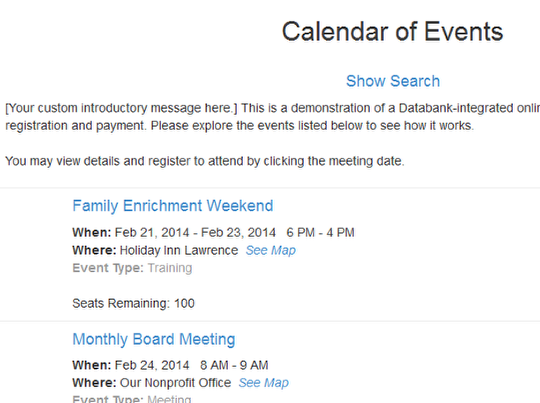 There are two different views of your events: Calendar and List. The Calendar View shows meetings in a standard calendar, one month at a time. The list view is a list of upcoming events sorted by event date. 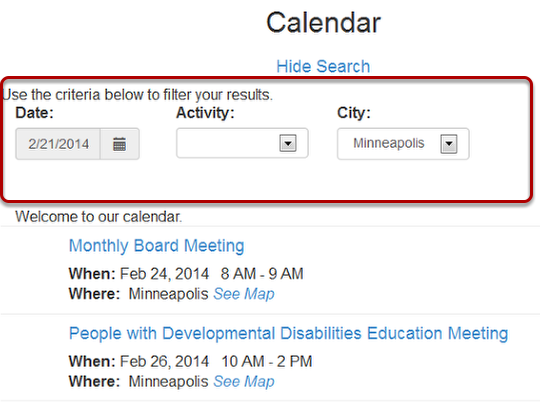 It is possible to limit what events will show on your calendar by choosing to show only specific meeting types. For example, if I wanted this calendar to only show meetings with the activity type Training, I would check the box for Training. When 'Allow Registration for Events' is set to Multiple, people can register for more than one event at a time. You are not allowed to use the options tab when setting up individual meetings when this option is enabled. 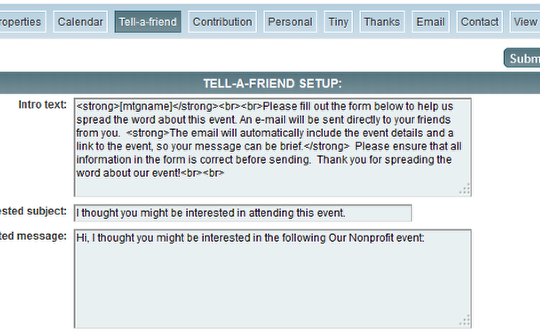 This option is especially helpful when allowing people to sign up for multiple volunteer opportunities. 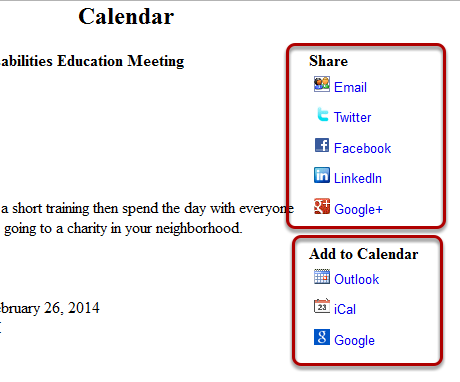 Sharing options and Add to Calendar Options. These appear while someone is registering and most likely in the confirmation email they receive. These settings control what someone will see if they choose to share your meeting via email in the Share links. You will want to set this up as you would a donation form except for the following caveat. If you choose to add a contribution option, that option will appear during every meeting registration that is handled by this form unless you specify a payment for that individual meeting. In that case, the individual meeting payment will override this default setting.